O'Neal doesn't take too kindly to Howard using his nickname. For all of his warts and trade demands, Houston Rockets center Dwight Howard is a pretty good big man. He’s just not on the level of Shaquille O’Neal. That’s the textbook definition of a facial, even if it’s technically something that never happened. 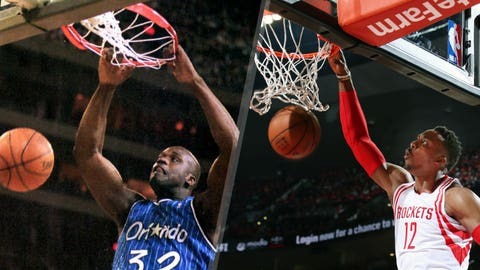 Maybe Howard should stop claiming to be ‘Superman’ before Shaq takes things to another level. Metaphorically, though, this is pretty much what happens every time O’Neal brings up Howard. The former always wants more from the latter, going so far as to say Howard couldn’t handle the bright lights of Los Angeles. O’Neal has tried to offer Howard advice before, but even those supposedly kind words always came off with the air of, "Believe me, I know, I’m better than you ever were." And that’s absolutely true. Shaq is one of the greatest centers ever. Howard is not. You just wonder if O’Neal is ever going to let up. Then again, when you hit someone with a move like this, how are you supposed to ever respect them?